When Americans think of oil executives, they tend to conjure up the image of J. R. Ewing: slick smile, sharp suits, cowboy boots, and a 10-gallon hat packed with bluster, vanity, and greed. According to Gallup, no industry is more widely reviled than oil and gas—not even banking, real estate, or heath care. The poll found that 64 percent of Americans disapprove of its activities. Only the federal government fared worse. The image is unfair in many ways. It’s true that the energy sector can be brutal; the business of pulling hydrocarbons from the earth seems to attract more than its share of ruthless personalities. But there’s a more nuanced character to the oil and gas industry. At heart—and yes, it has a heart—it’s an industry with a surprisingly charitable nature. And nowhere is the pulsing heart of the industry more evident than in Houston, where the fortunes generated by profits from energy companies have fueled some of the most impressive personal giving in the world. All of that oil money has fueled a massive experiment in private, voluntary initiative—a major healthcare system that is more private than public, more charitable than profitable. Its scale can only be described as Texan. The campus is equal in size to the Inner Loop of Chicago. It currently has over 28.3 million square feet of office space—more than downtown Houston, even more than all of downtown Los Angeles. (By the end of 2014, its square footage is expected to exceed 41 million square feet, which would make the medical campus the nation’s seventh-largest business district of any sort.) Every day, 160,000 people enter the area, which has grown into Houston’s largest employer. Every year, TMC hosts about 7.1 million patient visits, including 350,000 surgeries and 28,000 newborns delivered. Houston’s real philanthropic achievement, however, is not just the scale of the TMC. It’s the extraordinary quality of its institutions. In the 2013 U.S. News & World Report hospital rankings, TMC-affiliated institutions topped the charts. Methodist Hospital was a nationally ranked leader in 13 of 16 adult specialties. (Of the 4,793 hospitals included in the rankings, only 148 facilities—roughly 3 percent of the total—were considered a nationally ranked leader in even one of the 16 specialties.) St. Luke’s Episcopal Hospital, likewise on the TMC campus, earned national ranking in 10 adult specialties. The Texas Children’s Hospital was ranked fourth among all U.S. children’s hospitals. M. D. Anderson has been named the best cancer center in America for 9 of the past 11 years, including 2012. None of it would be possible without private philanthropy. M. D. Anderson, for instance, began a capital campaign in September 2006, with a goal of raising $1 billion within six years. Donations poured in from across the Lone Star state. From San Antonio, Clear Channel co-founder Lowry Mays and his wife, Peggy, donated $20 million. From Dallas, H. Ross Perot kicked in another $20 million. T. Boone Pickens contributed $50 million, with one condition. Before putting the funds to use, M. D. Anderson was required to turn the gift into a $500 million corpus within 25 years. Anderson hit the target within three years, and used the funds to establish the Pickens Research Endowment. Two years ahead of schedule, the capital campaign passed the $1.2 billion mark. There were more than 630,000 individual gifts, and a staggering 127 donors gave at least $1 million. It’s testimony to an extraordinarily generous culture—one that’s driven by energy profits. Of the top 10 corporate foundations in the region, for instance, eight are directly tied to the energy industry. As Federal Reserve Bank economist Bill Gilmer notes, Houston’s economy rests on the energy sector—not only drilling and exploration, but also downstream industries like refining, finance, and petrochemical production. It is there that much of Houston’s wealth has been generated, and from which much of the funding for good works like the TMC is likely to continue coming. To be sure, the extraction of sweet, light crude from deep in the earth is hardly animated by sweetness and light on the business side. The energy business is capital-intensive and very competitive. It requires leaders who can adapt and make things happen. Anthony Petrello fits that bill. Petrello is the chief executive officer of Nabors Industries, the world’s largest land-based drilling contractor. Nabors is hired by oil companies to drill oil and gas wells. Like many other leaders in the energy industry, Petrello is competitive and looking for ways to differentiate his company. His pedigree is perhaps a bit unusual for the industry: it includes bachelor’s and master’s degrees in mathematics from Yale—and a law degree from Harvard. Petrello is a Newark native. He left his job in New York as managing partner of Baker & McKenzie, arriving in Houston in 1991 to become president of Nabors. “The first five years I was in Houston,” Petrello recalls, “I worked six or seven days every week, and with my wife’s work schedule, we did not have much time to socialize.” He and his wife, Cynthia, a former New York actress, focused on their careers and kept mainly to a small group of close personal friends. And in the process he found some impressive allies, like Dan Duncan, the now-deceased chairman and director of Houston-based Enterprise Products, a leading North American provider of midstream energy services. A self-made man who grew up in rural east Texas, Duncan turned a small business with one truck, two partners, and $10,000 in cash into a multi-billion dollar energy company that today ranks among the nation’s most successful. Duncan and his wife, Jan, were among Houston’s most generous healthcare philanthropists. In 2006, they donated $100 million to Baylor College of Medicine to establish the Dan L. Duncan Cancer Center; two years later, they gave M. D. Anderson $35 million to create the Duncan Family Institute for Cancer Prevention and Risk Assessment, which addresses the risks—genetic, lifestyle—that can lead to cancer. In 2007, the Duncans made news with a $50 million gift, earmarked to create a collaborative institute that would research and treat pediatric neurological disorders. The Jan and Dan Duncan Neurological Research Institute opened in 2010. Today, it occupies 300,000 square feet at Texas Children’s Hospital. The center has more than 130 researchers led by Huda Zoghbi, a renowned Lebanese neurogeneticist. Ever since he left his small hometown of Wharton, Texas, Lester Smith has lived, from a strictly economic point of view, a rather charmed life. At age seven, he knew he wanted to be a wildcatter; to his nose, oil “just smelled like perfume.” Today, he heads up Smith Energy, a Houston-based firm that specializes in the exploration and production of oil and gas reserves. Cancer, adds Smith, is “a great equalizer,” one that doesn’t respect class or wealth. For that reason, he has donated $15 million to the Harris County hospital district to set up a clinic to treat poor families, like many of those that he grew up around in rural Texas. It now treats some 160,000 underserved people annually. “Illegal aliens, the indigent—they should get the same care that my wife gets,” he insists. Smith also raises money for cancer causes by hosting social events—most notably, ballroom dancing. The galas that he and his wife put on have become highlights of Houston’s social season. In February, the Smiths hosted 1,100 guests at the Legends Event for Texas Children’s Cancer Center, featuring Gloria Gaynor, the Pointer Sisters, and Nile Rodgers. The evening raised $32 million. It was again heavily underwritten by Houston’s oil-and-gas philanthropists. Over the next three decades, Wolff did quite a lot of things. His real estate firm has office parks all around Houston and led the development of what is widely known as the “energy corridor” along Interstate 10 in the western part of town—now home to a working population of 80,000 people. “It was all cows and rice fields back then,” he recalls. All the while, he was involved in the city’s philanthropic community, serving as chairman of the Houston Parks board, as well as Metro, the regional transit agency, and on the board of the Houston Grand Opera. But these days Wolff’s great passion is medical philanthropy. He donated 10 acres of prime land for the new TMC West Campus, which now includes Texas Children’s Hospital, Texas Methodist, and others. He is now working, largely through additional land he has acquired, to aid the expansion of the TMC toward Beltway 8 (Houston’s outer-loop freeway) and the surrounding suburban communities. The idea, Wolff explains, is to bring the hospitals closer “to where the patients are.” For generations, Houstonians—particularly those with children—have been moving to the city’s periphery. As the TMC’s main campus has expanded, traffic and parking have become more difficult for people coming from the communities surrounding Houston. The market is certainly there: Texas Children’s CEO Mark Wallace estimates there are 400,000 children within a 10-minute drive of the new campus. In 20 years, says Wallace, the west-side hospital will be as large as the original site. That sense of service reflects the spirit that made the Texas Medical Center possible in the first place. In a state where the proportion of uninsured is higher than the national average, the TMC provides critical services for the poor—and is sufficiently well funded to deliver them at the highest level. “Like other cities, Houston has its challenges,” observes Houston Endowment’s Ann Stern. “But Houston is exceptional in that philanthropy makes up for a lot of it. It’s kind of a calling here. It’s a culture of leadership—of getting things done.” And it has made Houston perhaps the most philanthropic city in America today. This piece first appeared at The Philanthropy Roundtable. 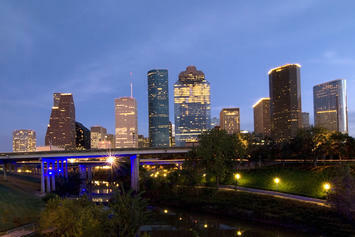 Houston skyline photo by Bigstock.